Jubei-Chan: The Ninja Girl - Secret of the Lovely Eyepatch Vol.1: A Legend Reborn! One of the most original and off-the-wall series on the market. Action-packed martial arts meets super-deformed slapstick comedy in the hilariously angstful Jubei-Chan: The Ninja Girl. This is one of those weird comedies that you will either love or hate from the moment your DVD player's laser hits the first episode. But, if you like your anime with bizarre characters in exaggerated situations, then this show is right up your alley. Dare I say it, this show may be funnier than Trigun. 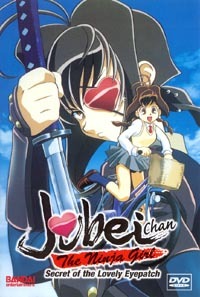 Jiyu Nanaohana, nickname Jubei, is a cute teenager who's just moved to a new town with her novel writing dad, who just happens to be perpetually stuck on the last scene of his book. So, on her way to her first day of school she meets up with Chief and his entourage who takes care of her nagging dad and then Shiro Ryujoji who helps her find her way out of a bamboo forest that acts like the lost woods in The Legend of Zelda. Oh yeah, Jiyu is a lovely girl who is developing rather nicely, which leads Koinosuke Adago to believe Jiyu the person matching the description, "a plump, bouncy bon bon," that his master, Yaguyu Jubei, died telling him about 300 years ago. Thus she is entrusted with a Lovely Eyepatch, which seems to be from a fashion-deprived era due to the fact it is, well, a pink heart on a string. Once Jiyu dons the Lovely Eyepatch she is instantly transformed into a samurai warrior with all the knowledge and fighting skill of the first Yagu Jubei. But she could care less, so she throws the hideous thing in the trash the next day. The fun from the show seems to pour from the exaggerated nature of the characters which adds to the diversity of the show. The scenes involving the Samurai duels are sharp-lined and detailed while the everyday-life scenes are often rounded and feature some type of over emphasized feature. Chief's two followers literally look like monkey's and the later villains take on even greater cuteness. Tenchi Muyonosuke (dare I point out the ‘Tenchi Muyo' in the name? ), for instance, is a shrill little color-form that could fit in perfectly in an A-Ha music video if he was in black and white. The majority of the English dub voices seem to fit their characters perfectly, though Koinosuke's voice seems to be too deep and rough sounding when compared to the original and the young appearance of the character. On the other hand, Jubei-chan's voice is top-notch and really brings the character a lot of depth. The only place this release really lacks is in the extra features department. A simple series of stills depicting how to cook with Jubei-chan is all that accompanies this disc, apart from the normal DVD features. Yet, this is a high-profile comedy in the vein of Haunted Junction and better special features will undoubtedly crop up with the other releases. Besides, if you buy all four volumes, you can redeem the promotional cards included in the volumes for a free Jubei-Chan T-Shirt. Overall, the first volume of Jubei-Chan: The Ninja Girl is shaping up to be another one of those must-see series. But, there are a lot of questions left to be answered after the first volume. Like, what's in the right drawer of Jubei-chan's dresser? Will Jubei-chan ever go with Maro and Sachi to the sweet shop? And just how many teachers will Jubei-chan's class go through? To find out these answers, you're just going to have to see the rest of the series and find out.